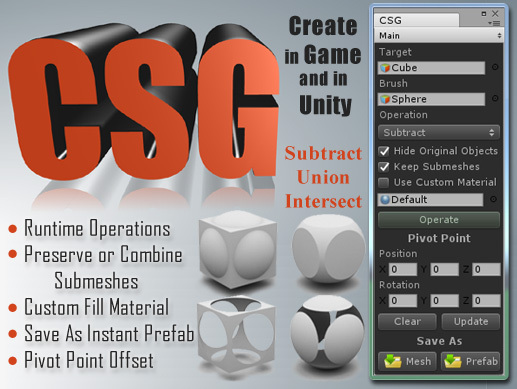 CSG (Boolean operations) allow you to create new meshes by performing Subtraction, Union and Intersection between objects. The creation is done in the editor and support for run time operations is in the works. The resulting geometry preserves the texture UV coordinates of the original meshes. 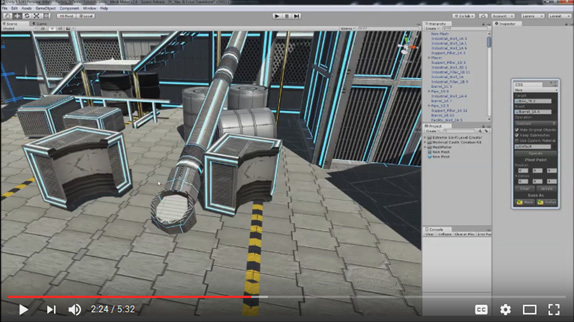 The program also handles rotated and scaled objects as expected and is suitable for objects with multiple materials and submeshes. It is not recommended to do more that a few operations on the same target object or the geometry may become corrupted. While the program works well on simple objects it may fail on very complicated objects or objects with underlying problems like holes in their geometry. It is highly recommended that you make a copy of the target object and save your scene before using this software.